Boldly big and ironically Breguet. As someone who appreciates the original F.P. 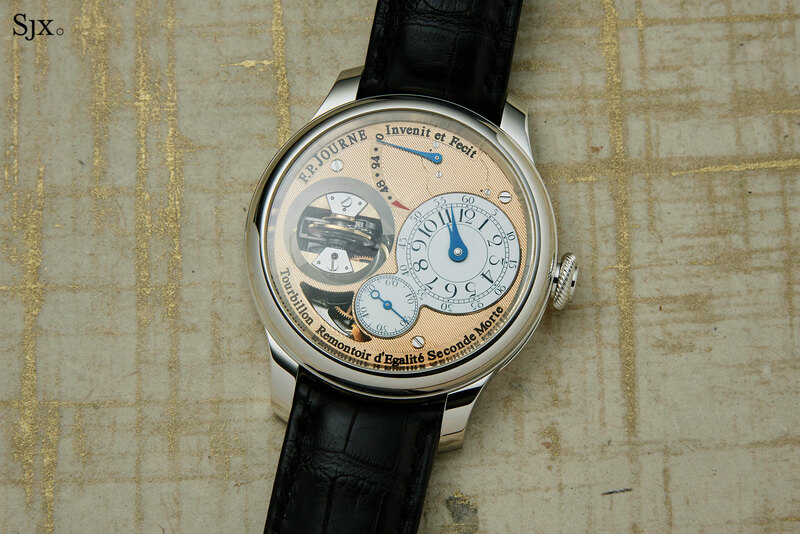 Journe tourbillon, I was intriguing by the vertical tourbillon that Mr Journe described in some detail last year. That, however, didn’t prepare me for how much watch the new Tourbillon Souverain Vertical is. Unlike the original tourbillon that was conventional, the Tourbillon Souverain Vertical has a vertical tourbillon, which means the rim of the balance wheel is visible from the front. And it is also a 30-second tourbillon, making one revolution every half-minute, or double the rate of a conventional tourbillon. The watch has been upgraded in several ways beyond the tourbillon, but first, the rationale behind the verticality. 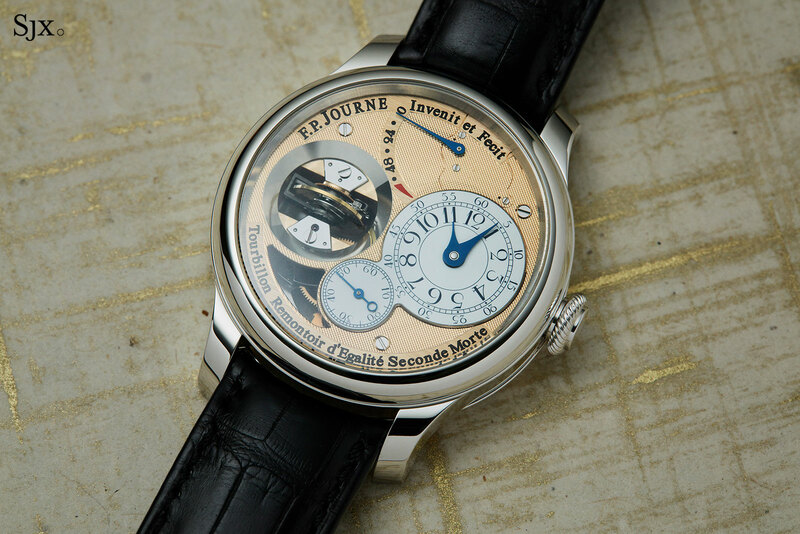 According to Mr Journe, an average wristwatch spends a third of its time – no pun intended – off the wrist of its owner, mostly during the time when it is removed at night. So the purpose of the vertical tourbillon is straightforward: ensuring the balance wheel is always vertical, regardless of whether the watch is on a pin buckle and lying flat on its back, or on a folding clasp and sitting on its side. Consequently, the vertical tourbillon actually returns to the original premise of Abraham-Louis Breguet’s invention of the tourbillon, which is to average out gravitational errors in a balance wheel that is in a constant vertical position, as it was in clocks and pocket watches. And because the vertical tourbillon makes one rotation every 30 seconds, it averages out errors at twice the rate of an ordinary tourbillon. That irony is appealing, and also reminiscent of Mr Journe himself, who can seem dour at most times but is actually frequently funny in private settings. 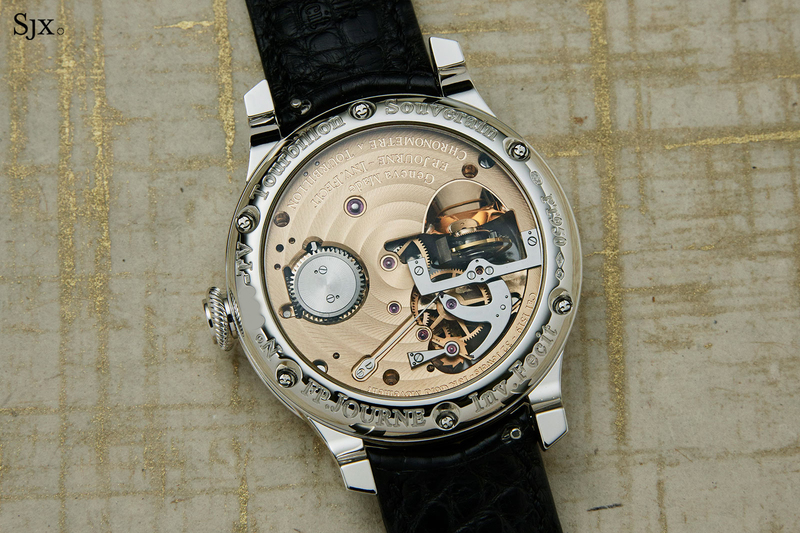 The vertical tourbillon is necessarily thicker, since the movement height will about the diameter of the balance wheel. In numbers that means the cal. 1519 inside is 34.6mm in diameter and 10.86mm high, compared to 32.4mm and 7.15mm in the earlier tourbillon, which is an increase in thickness of about 50%. That results in a watch case that is significantly larger at 42mm in diameter and 13.6mm high, primarily to accommodate the height of the tourbillon. The Tourbillon Souverain Vertical is actually thicker than the F.P. Journe grande sonnerie (12.25mm high), and almost as thick as an Audemars Piguet Royal Oak Offshore Chronograph 42mm (14.18mm). It doesn’t help that the classic F.P. Journe watch case has flat, vertical sides, with a narrow bezel and back profile, a look that emphasises the height of the case. For someone who appreciates the characteristic slimness of most F.P. Journe watches, the Tourbillon Souverain Vertical feels too big. It’s also worth pointing out that the Tourbillon Souverain Vertical is only available with a 42mm case; 40mm is not an option, at least for now. But as a watch, or an object, there is a lot to like about the Tourbillon Souverain Vertical. To start with the watch has no dial, instead the time is indicated on a sub-dial that sits on the 18k rose gold base plate of the movement, just as Mr Journe originally intended. His first wristwatch tourbillon of 1991 was constructed the same way, with an exposed base plate, and he subsequently preserved the look in later models with solid gold dials. Here the base plate has been finished with Clous de Paris, or hobnail, guilloche, almost camouflaging the fact that it’s the movement. 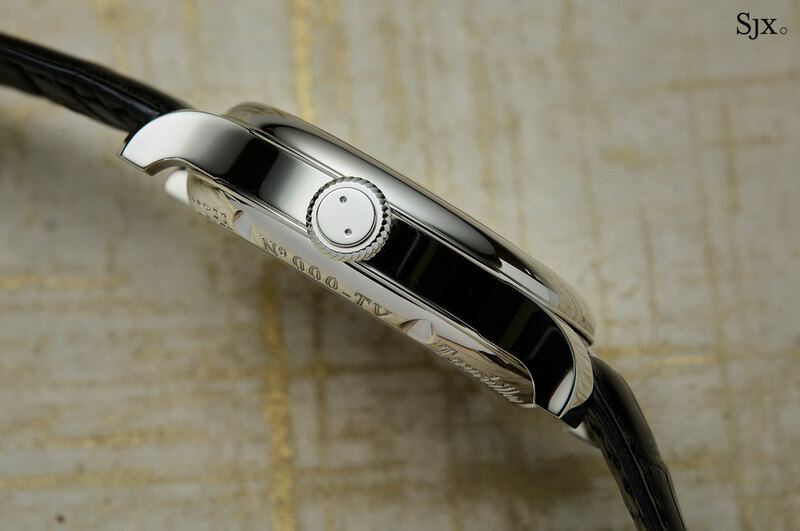 Sitting on a slightly raised, platform, the enamel sub-dial is also an unusual, but appealing detail, giving the dial a smooth surface that is less metallic in appearance. 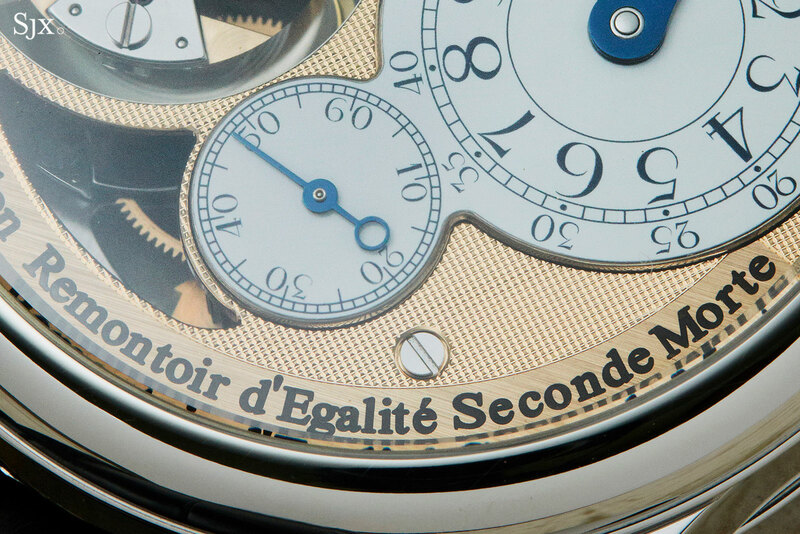 It’s worth noting that the font for the numerals on the sub-dial is an evolution of the classic F.P. 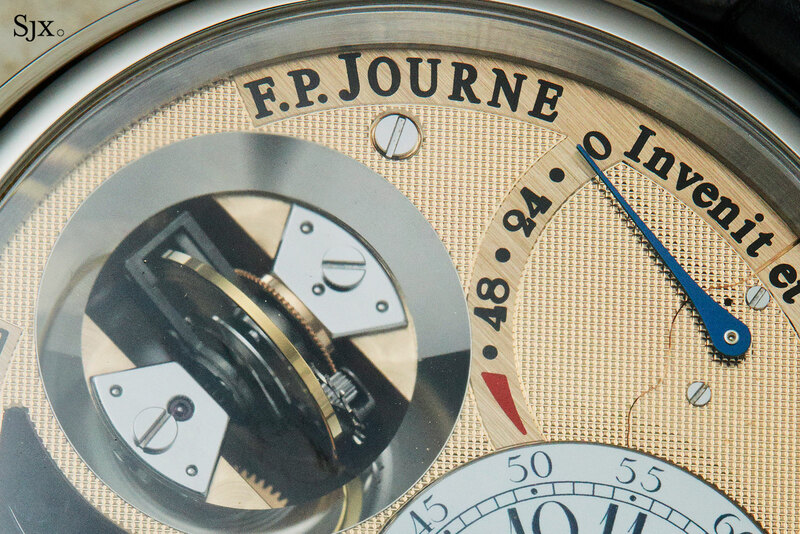 Journe typography. The new font is slightly more flamboyant, and well suited to the enamel. What does feel a bit much is the heavyweight font for the engraving lettering on the base plate, which is done on linearly brushed segments and filled with black lacquer, making it even more prominent. The tourbillon sits in an aperture with a wide, mirror polished rim, intended to highlight and reflect the tourbillon carriage. On the back a broad, polished half-bowl serves the same purpose. They serve the purpose well, though it does leave the tourbillon looking reduced in proportion. 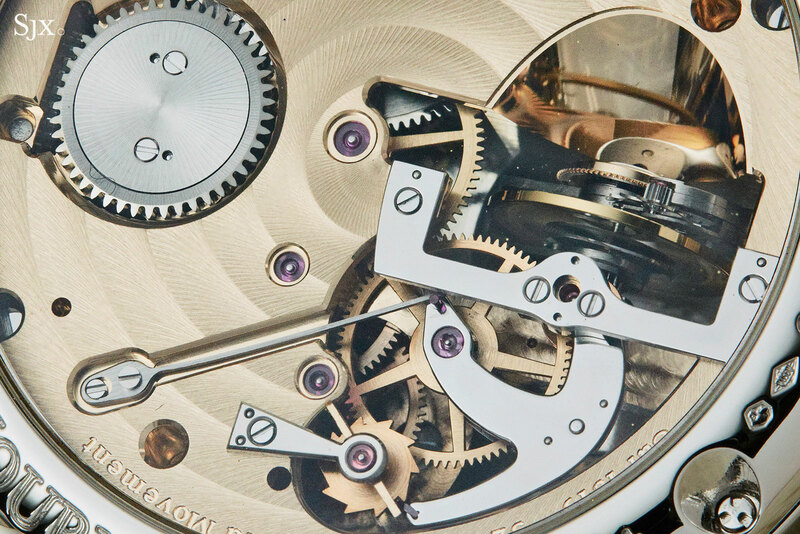 Unlike the movement in the original tourbillon, the cal. 1519 has been enhanced on the back with cut-outs on the full plate that expose the remontoir d’egalite constant force mechanism and the underside of the tourbillon. Compared to the unbroken expanse of movement in the original, this looks far more interesting, especially with the mirror polished bridges for the remontoir and tourbillon. Not only is the movement visually appealing from the back, it also seems slightly cleaner in terms of decoration than the earlier tourbillon. And it is also equipped with a larger barrel, giving it a more practical 80-hour power reserve, almost double the 42 hours of the earlier tourbillon. The Tourbillon Souverain Vertical is a winner in terms of concept, but the size is an obstacle for the traditional F.P. Journe fan. That, however, is probably why it makes sense for the brand, because it will likely appeal to fans of complicated watches that find his originals too flat. Having made perhaps 1000 tourbillons to date, F.P. Journe likely needs a whole new clientele, especially in the United States, which along with Japan form its biggest market. But unlike Japan large watches are more popular. Price-wise the Tourbillon Souverain Vertical is a big jump over its predecessor, costing about US$80,000 more (with a retail price of about US$250,000). That’s not exorbitant as it puts the watch on par with most of the competition, though it does remove some of the value-proposition appeal of the original. The Tourbillon Souverain Vertical is priced at SFr244,800 in rose gold and platinum SFr248,400 in platinum. Prices include 7.7% Swiss tax. 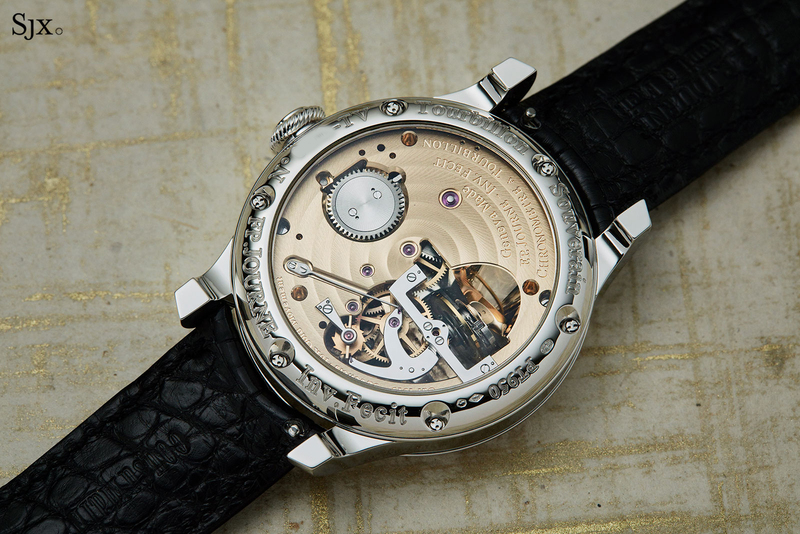 A new tourbillon, 20 years later.